In the physics literature, geometric quantization is an operation that arises from an attempt to make sense of the passage from a classical theory to the corresponding quantum theory. 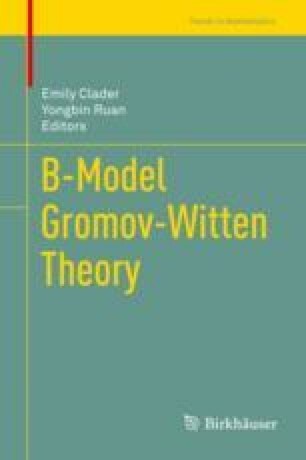 In mathematics, on the other hand, the work of Alexander Givental and others has revealed quantization to be a powerful tool for studying Gromov–Witten-type theories in higher genus. For example, if the quantization of a symplectic transformation matches two total descendent potentials, then the original symplectic transformations matches their genus-zero theories, and, at least when a semisimplicity condition is satisfied, the converse is also true. In these notes, we give a mathematically-minded presentation of quantization of symplectic vector spaces, and we illustrate how quantization appears in specific applications to Gromov–Witten theory. The authors are indebted to Huai-Liang Chang, Wei-Ping Li, and Yongbin Ruan for organizing the workshop at which these notes were presented. Special thanks are due to Yongbin Ruan for his constant guidance and support, as well as to Yefeng Shen for working through the material with us and assisting in the creation of these notes. Y.P. Lee and Xiang Tang both gave extremely helpful talks at the RTG Workshop on Quantization organized by the authors in December 2011 at the University of Michigan. Useful comments on earlier drafts were provided by Pedro Acosta and Weiqiang He. A number of existing texts were used in the authors’ learning process; we have attempted to include references to the literature throughout these notes, but we apologize in advance for any omissions. This work was supported in part by FRG grant DMS 1159265 RTG and NSF grant 1045119 RTG.